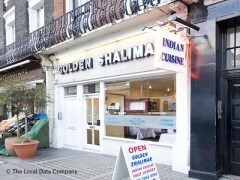 About: The Golden Shalimar is an Indian restaurant serving typical Indian dishes. They have a fax ordering service and they also do take away. The restaurant caters for private parties for up to 25 people. My wife, son & I had a Sunday Times £5 lunch here yesterday, Sunday. friendly efficient service, clean well-presented tables, lovely Indian background music. A choice of 4 2-course set meals - all delicious & good quality. A nearby table of 4 tucked into their "normal" menu choices with gusto. We'd been intrigued by the 1st ("worst") review on this site, which does the Shalimar a disservice. Perhaps things have changed since then? Only criticism were the cold plates, but we wolfed the food down so fast we hardly noticed! Thanks guys! John. Worst indian restaurant ever. Expensive, small portions (5 small pieces of chicken in sauce for 2 persons) Stay away! I stopped in here for a quick bit to eat and found this to be an excellent quaint little spot. The decor was very classy and the service was very professional. Waiters wore bowties and vests. I ordered the Chicken Tikka Masala and Nan bread and found it all to be very tasty. After dinner the service was very professional and they even brought a warmed towelette to clean your hands. Overall the service was very professional and fairly quick and the food was quite good also. This would be a good place for a nice quite romantic evening or a meal with a few blokes.